As a former skeptic (and coincidentally, Floridian), I can tell you with sincerity that at one point in my life, it seemed more than absurd and extremely unlikely that I would find myself riding a goofy looking wide-tired bicycle through a thick, immovable blanket of snow in the backwoods of South Dakota. But, fortunately for me, life is absurd, and, as far as I can tell, my biggest strong suit is proving myself wrong. So, here I am to tell you all the reasons why you should toss out your inhibitions and go take a spin on a fatbike. Fatbiking, ultimately, derived from a pure and unadulterated love for cycling. Conditions that require a fatbike are notoriously tough to cycle through: snow and sand. But, fortunately for us, someone in Alaska got sick and tired of not getting rad on a bicycle and decided to invent a way to shred through the gnarliest of conditions. However, just because good fatbiking conditions are notoriously tough, it doesn’t mean that suffering is inherent on a fatbike (big apology to all the crazy cycling masochists out there who turned to this article looking for a new way to torture oneself). Once I got the hang of riding a fatbike (core strength! ), and got over the awkward nervous phase (aka - learned to trust the infinite traction of a 4.8-inch wide tire), I had the most fun I’ve ever had in my life! Fatbikes are just like any normal bike with the exception of the wider tire (anywhere from 3.8 inches wide to 5.0 inches) and accordingly a wider Q-factor (estimated distance between your feet when on the pedals). Most fatbikes come rigid, but cyclists who use them their year-round trail bike are known to install a suspension fork for a more plush ride (see RockShox’s Bluto or Manitou’s Mastodon). I ride my fatbike year-round, but I am perfectly happy to admit that I have the most fun on it in the snow. To further diversify the profile of fatbiking as an outlier, most of the best fatbike riding you’ll ever do will be in the dark. In the dark hours of the night, the snow is protected from the oppressive heat of the sun. Night riding, guided by the full moon or by head and handlebar lights, can be exhilarating. The forest is calm, your attention is peaked and the night is yours. It’s a beautiful thing. There’s this insane feeling of being somewhere you’re ‘not supposed to be’ when you’re out in the backcountry in the middle of a snowstorm at 8 pm at night. And it’s exhilarating. The sky is dark and the forest feels like your own. Throw in 2 or 3 of your favorite people and just as many fatbikes and you will feel like a kid on Christmas morning. Every single time. Fatbiking is a lot like having a superpower to tap into: Gliding through the thick blankets of Winter, weaving in and out of trees, doubtlessly following a thin white ribbon guiding you through the night. All of this bliss (!!!) while nearly everyone you know is huddled up, confined and isolated inside the four walls of their warm Winter cages. These moments of frivolousness and impossibility are forever ingrained in my mind. Not my frozen ears from the one ride where I forgot to wear a hat. Part of me thinks it’s the overcoming aspect of fatbiking that I like so much. Almost everything about the sport is unlikely - from it’s Alaskan Iditarod inception story, to the fact that your body tempature is skyrocketing with every pedal stroke made in the frigid air. The mere fact that you can maneuver around frozen water with such agility and grace is amazing to me! But really, it takes a little bit of an extra mental effort to get yourself out there and pedaling in the cold. But, before anyone gets any funny ideas about fatbikers being secret masochists, let me be really clear here: Once I figured out the clothes that would keep me warm while fatbiking and accepted that I would need to carry a backpack for all the layers I would want to shed along the way, there was not a day this past Winter that I didn’t absolutely crave a fatbike ride. It’s pure fitness riding. It’s a full body workout. It’s a guaranteed adventure. It’s a sure-fire way to laugh at yourself. It’s a means of transportation even in icy conditions. It’s a great way to stay fit year-round. It’s an anecdote for Winter depression. And it’s ultimately a great way to get more saddle time. And honestly, who doesn’t want that? To simplify things, the fatbike is a burly built, all-terrain, snow slaying shred sled that will get you from point a to point b regardless of the circumstances. Fatbikes are a vehicle of purpose and of fun. They are a weapon and a toy. They are a multi-purpose dream machine. And despite what any dingus who has never ridden one on snow wants to tell you, they are efficient. If you’re reading all of this and thinking, “That all sounds great, but I can’t really afford another bike in my quiver” or “Yeah, but I’ll only get to ride that bike 3 months out of the year,” as someone who had those exact same thoughts, I think you should hear me out. Before you ever purchase a bike, I highly recommend paying for a demo ride on said bike. And, in the same way that you wouldn’t go for a rip with a road bike on dirt trail, you probably shouldn’t take a fatbike on your favorite MTB trail and expect it to flow like your full suspension does. It wont. That’s not what it’s made for. 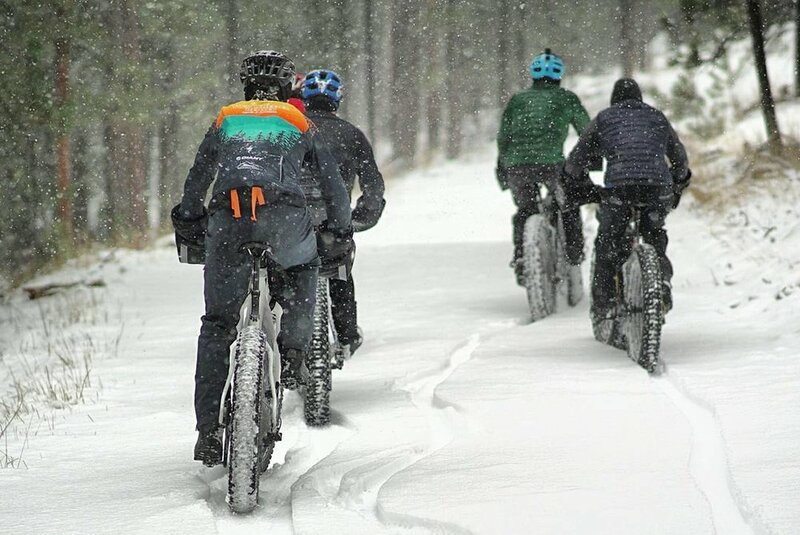 There are a handful of places in the United States where you can go to ride fatbikes on snow trail: Vail, Colorado, Spearfish, South Dakota, and Pocatello, Idaho, just to name a few. My sincere recommendation to you, if you’re considering trying fatbiking, is to go to one of these places, or the closest town nearby that holds great snow and consult a bike shop for both a rental and recommendations on groomed snow to ride. I can’t guarantee that after one ride you’ll be a converted fatbiker. Fatbiking can be difficult at first, and much like mountain biking, it takes more than 2 or 3 attempts to get used to the ride style. What I can guarantee you is at least one glimmering moment where you catch yourself smiling from ear to ear, joyful and child-like, playing in the snow and riding a bicycle. And in this twisted and fast paced world where simple moments of bliss are a rarity, for some people, that’s enough. Dialing in Tire Pressure: How Low is Too Low?